Venezuela Crisis has been named 2018 World Press Photo of the Year. José Víctor Salazar Balza catches fire amid violent clashes with riot police during a protest against President Nicolás Maduro in Caracas, Venezuela. For the first time in its 61-year history, the esteemed World Press Photo (WPP) competition this year announced nominees for its grand prize before declaring the Photo of the Year in April. 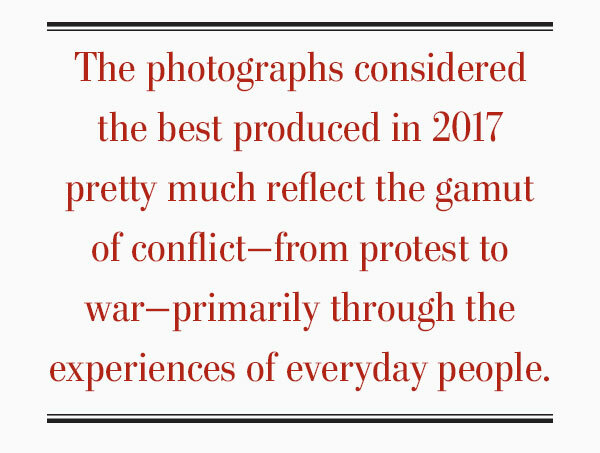 Selected from 73,044 images submitted by 4,548 photographers from 125 countries, the photographs considered the best produced in 2017 pretty much reflect the gamut of conflict—from protest to war—primarily through the experiences of everyday people. Not soldiers. Not police. And not politicians. Rather, there are refugees, victims, survivors, ex-hostages and, notably, agents of change. 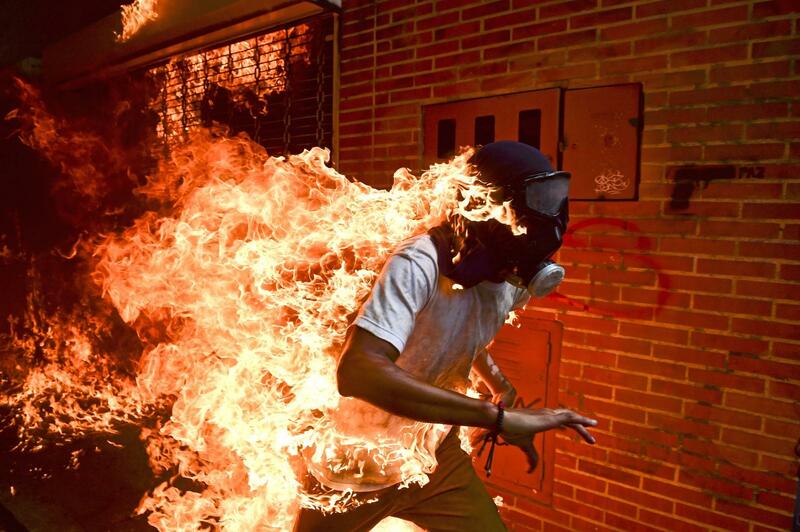 Now on exhibit at the Canadian War Museum in Ottawa, Venezuelan Ronaldo Schemidt’s winning photograph captures a gas-masked, anti-government protester engulfed in fire, running in what appears to be an alley in Caracas. Stencilled in silhouette on the wall next to him, its red brick glowing as it reflects the flames, is a gun, the word paz (peace) emerging from its barrel like a bullet. The photograph “symbolizes resistance,” says exhibition curator Jerzy Brinkhof. “What we see here is a man standing up against what he thinks is injustice…and that is something that the jury is looking for. Entitled Venezuela Crisis, it is a gripping photograph, a classic in the pantheon of World Press Photo images that are, as often as not, the best depictions of humankind’s worst moments. 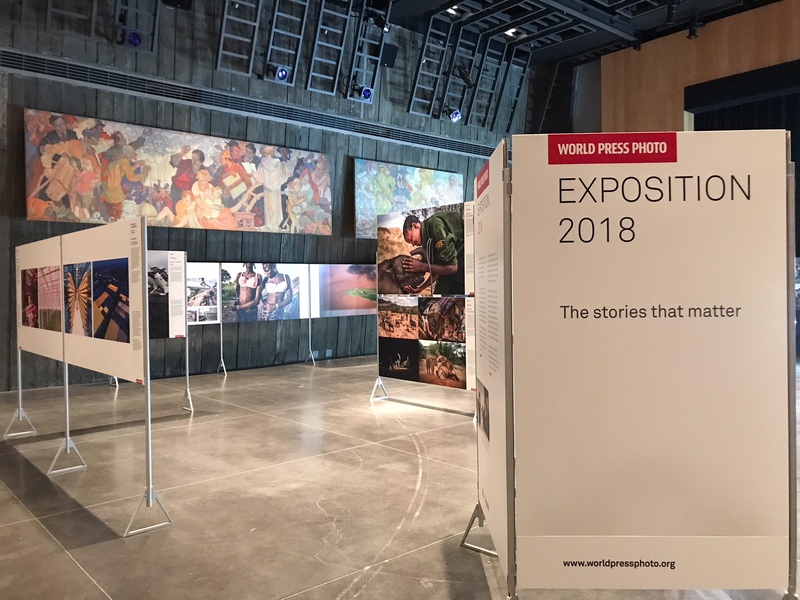 The 2018 World Press Photo Exposition at the Canadian War Museum. The show continues until Aug.12, then moves to Montreal, Toronto and Chicoutimi, Que. Each year, the competition awards prizes to dozens of photographs—both as singles and stories—in eight categories: contemporary issues, general news, nature, people, sports, spot news, long-term projects and—new this year—the environment. Only one receives the grand prize. It can come from any of the category winners, but the WPP Photo of the Year has most often been a spot-news picture. And over the years, it has inevitably spoken to more than the moment it captures. Schemidt, a staff photographer for Agence France-Presse based in Mexico, photographed 28-year-old protester José Víctor Salazar Balza as he caught fire amid violent clashes with riot police. It took place during a protest against plans by President Nicolás Maduro to revise Venezuela’s democratic system. Maduro ultimately enforced his will, replacing the opposition-led National Assembly and effectively consolidating power for himself, but not before opposition leaders rallied mass protests to demand early presidential elections. During clashes with the Venezuelan national guard on May 3, 2017, hooded and masked demonstrators lit fires and hurled stones. 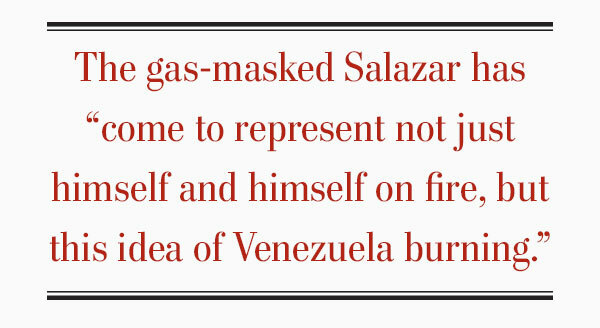 Salazar was set alight when a motorcycle’s gas tank exploded. He survived with first- and second-degree burns. Beyond Venezuela, the world also burns, set alight by fiery protest against resurgent fascism, high-level corruption, a widening gap between rich and poor, race, gender issues, human-rights abuses, environmental degradation and more. At its most passionate, it is war in the streets—reminiscent of but perhaps more intense and violent than the anti-war and civil-rights demonstrations of the 1960s. Events such as the seminal Arab Spring in 2010-11 precipitated actual wars and, sometimes, sweeping change, brought about not by invading armies but by individuals with common complaints and high ideals. Like their 1960s progenitors, these agents of change don’t wear uniforms or hold office. Nor do the innocent victims of war and violence. Nor the millions of refugees spawned by conflict. The winning photographs chosen by the Netherlands-based non-profit often expose the plight of the oppressed, threatened, persecuted, deprived and homeless to the world. Their common threads are universal and timeless. Year after year, the World Press Photo exhibition—in Ottawa until Aug. 12, then on to Montreal, Toronto and Chicoutimi, Que.—chronicles humanity’s highs and lows. A young refugee cries as he climbs on a truck distributing aid near the Balukhali refugee camp near Cox’s Bazar, Bangladesh. The photograph is part of a series by Canadian Kevin Frayer that took second in General News (Stories). It is the second straight year Frayer has placed at the WPP. Among the award recipients this year are Irishman Ivor Prickett’s photographs of Mosul’s starved and war-weary evacuees, American Anna Boyiazis’s photo essay on women of Zanzibar breaking conservative Islamic tradition by learning to swim, and Australian Adam Ferguson’s portraits of young girls who escaped after Boko Haram had outfitted them with suicide bombs. Canadian Kevin Frayer of Getty Images won second prize in the General News (Stories) category for his powerful black-and-white series documenting the tortuous journey of Rohingya refugees fleeing ethnic cleansing in Myanmar. 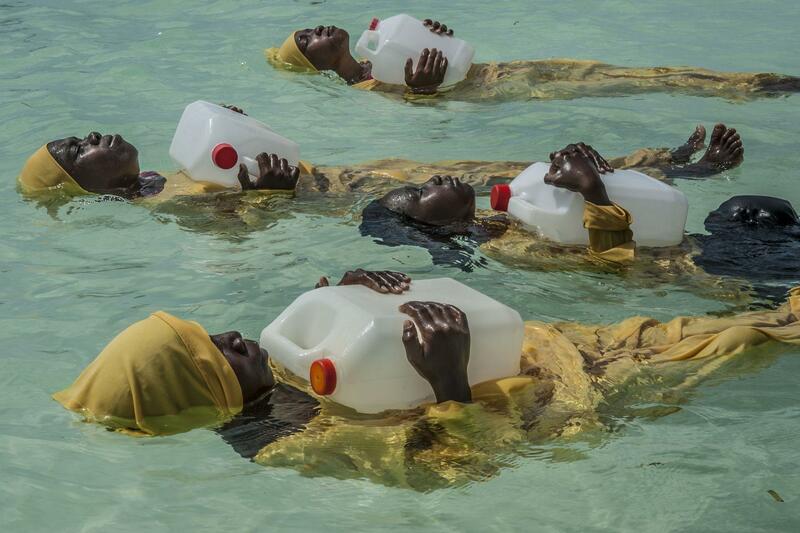 In Finding Freedom in the Water, young women learn to float in the Indian Ocean off Nungwi, Zanzibar. Traditionally, girls in the Zanzibar Archipelago are discouraged from learning how to swim, largely because of the strictures of a conservative Islamic culture. The exhibition of more than 160 large-format images will be seen by a projected four million people in 100 cities and 45 countries. World Press Photo also publishes an annual book. Its grand-prize winners inevitably have impact and resonance—sometimes fleeting; usually not. Who can forget how Nick Ut’s 1972 photograph of a naked Phan Thi Kim Phuc running from a napalm strike on a Vietnamese village helped hasten the end of American involvement in Vietnam? Or the heart-stopping impact of Yasushi Nagao’s 1960 image of right-wing student Otoya Yamaguchi wielding a sword as he assassinates Inejiro Asanuma, Socialist Party chairman, in mid-speech on a Tokyo stage? And then there’s Tank Man. 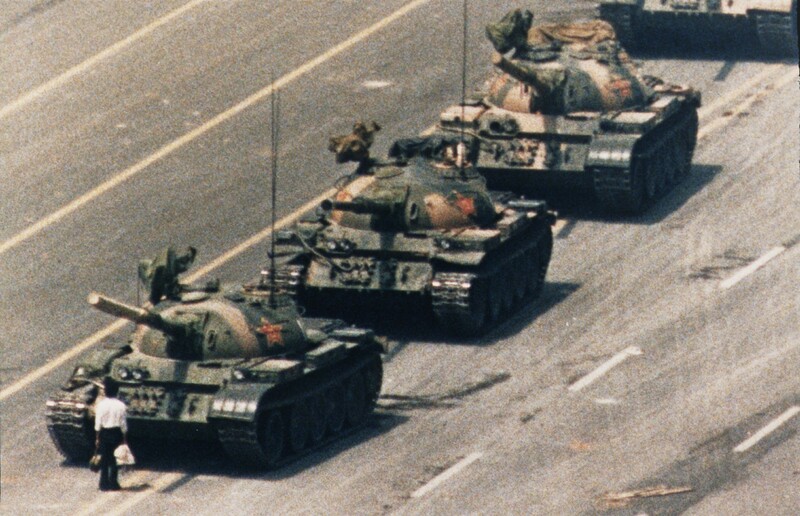 Charlie Cole’s iconic 1989 photograph for Newsweek of a lone, unidentified protestor confronting Chinese army tanks near Tiananmen Square stands among the most recognizable protest pictures ever taken. Not a single subject among these and many other grand-prize winners over the decades wore a uniform or held office. A demonstrator confronts a line of People’s Liberation Army tanks on Chang’an Avenue in Beijing during protests for democratic reform on June 5, 1989. Schemidt photographed Salazar fleetingly as he ran for help. Others documented him as fellow demonstrators doused the flames and he received medical attention. “A few days afterward I saw him on social media, inviting people to continue the protests on the streets,” Schemidt told the British Journal of Photography. Despite the efforts of Salazar and hundreds of thousands of other Venezuelans who began taking to the streets in 2014 to protest criminal violence, corruption, hyperinflation and chronic shortages caused by government policies, Maduro won re-election in May. The result was denounced as fraudulent by many countries, including Canada, which banned formal military co-operation and downgraded diplomatic relations with Venezuela. 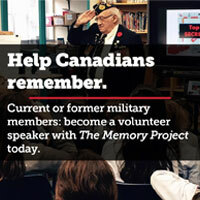 For more, visit https://www.warmuseum.ca/event/world-press-photo-exhibition-2018/ or https://www.worldpressphoto.org/.